Jobs alternatives are changing these days and more and more people are complaining about getting paid every two weeks. Getting paid every two weeks causes people to become stressed about money, and even paying bills late or overdue. Now you have choices to start earning part or full-time cash at your convenience. Delivery apps like Doordash, Ubereats, Postmates all give you the freedom to set your own hours and even earn as much cash you want. You simply deliver food for restaurants to customers. Doordash is in thousands of cities in the United States and Canada. The icing on the cake is getting paid daily and keeping 100% of all your tips! 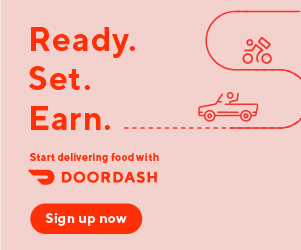 Doordash gives you the option of getting paid weekly or every day. So, once you are done for the day completing your deliveries you can either cash out what you have earned or wait to be paid weekly every Monday. Delivering with Doordash can open up so many doors. You can pay for a long overdue trip, or pay bills that are behind, spending more time with your family or kids. You can even exercise and learn your city. Must have either an Android or iPhone. You can deliver with any vehicle. Must have a valid driver’s license, insurance, and a decent driving record. Don’t have a car? So what! Use your motorcycle, scooter, bike, or you can even walk in some areas. Sign up today and receive your first check or cashout this week.